The 5-in-1 Collapsible Reflector Kit is versatile in the field and in the studio, providing shadow-lightening detail in your subject, using available, or studio lighting. 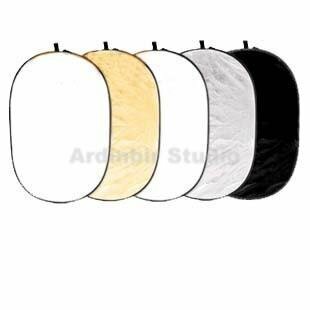 It contains a translucent white disc, which is perfect for softening direct sunlight, or lights without diffusion. Use the removable, reversible zippered slipcover to reflect light into shadow areas of your subject. The cover consists of the following colors: silver, gold, white and black. This reflector is perfect for portraits and still-life setups. It folds down to 1/3 its open size, and comes with a carry case. Gold produces a natural, golden fill that is great for sunsets or indoor portraits.